Templates make it easy to quickly send eCards, invitations and surveys to individuals and groups as well as to ensure consistency in your communication. 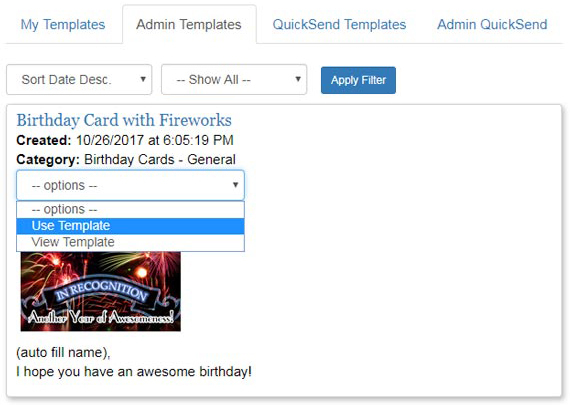 If you wish to send recurring eCards for birthdays or other occasions, you must first set up template eCards to use that feature. An eCard Template can only be created from an eCard, invitation or survey in your 'Sent eCards' bin. If you put a person's name directly in the Greeting line (e.g. Dear Bob), then all of your eCards sent with this template will say "Dear Bob." To avoid this, create your eCard template using the 'autofill names' feature to insert people's first names from your address book. Alternately, you can enter a generic greeting (e.g. Dear Valued Customer) or not use the greeting line at all. To use an eCard template, go to eCards > Templates or go to eCards > Create New in the navigation and click on the 'Templates' tab. Find the eCard template you want to use and click the thumbnail image to create the eCard. You can then edit it or click on the "Address and Send" button to just add recipients. Multi-User Plan administrators can share eCard templates with their users. thumb_up Multi-User plan members cannot delete templates that have been given to them by their Multi-User Plan administrator. 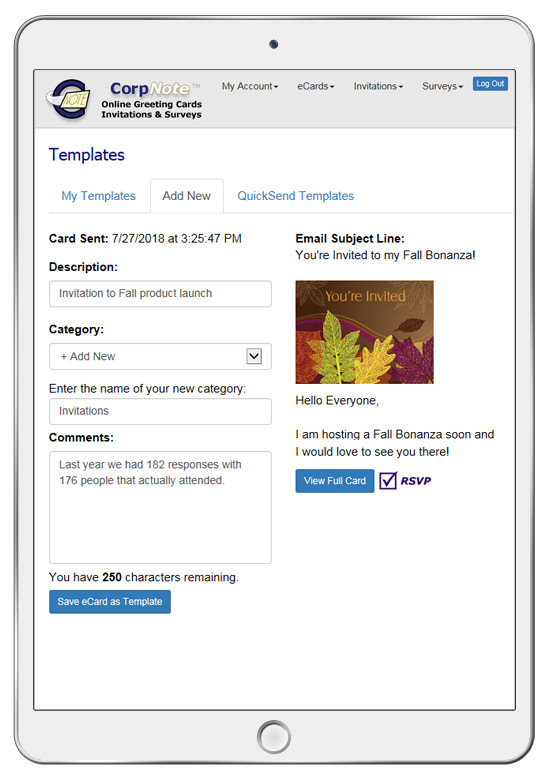 QuickSend enables you to quickly add a recipient and send your eCard, invitation or survey in less than 30 seconds. You do not need to download an app on your device to use this feature. QuickSend templates work similarly to regular templates except you send them to one recipient at a time. They are perfect for Tradeshows, Sales Meetings, Customer Service follow ups and more! For more information, view the QuickSend Speed Templates tutorial.